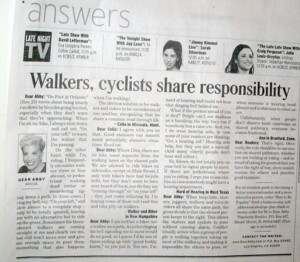 Has Dear Abby Been Reading The Cycling Dude? Imagine my surprise when I saw her latest column, in this mornings OC Register. "Good manners can smooth many potentially abrasive situations." "The rule should be to use caution on shared pathways, whether you are walking or riding -- and instead of taking for granted that you have the right of way, show consideration for others and practice good manners." The letters sent in to Dear Abby, that she shares in this column, make some valid points. As readers of this blog know I've been saying this, and more about cycling safety on the street, and on the trail, in essays, and Special Reports (The Back Bay, The Huntington Beach Bike Trail, Share the Road, etc...) since day 1, 5 years ago, and in a whole slew of posts, in a Special Archive Category, since October 2006, and not always to universal acclaim, either. Most of the OC doesn't know this Blog exists, and my worldwide traffic, as mentioned the other day, is miniscule. I don't kid myself about my reach, and influence. More people will see her column than discover the resources in my sidebar, hands down. One single column by Abigail Van Buren will be seen by millions worldwide, in print, and online, and one assumes that her popularity means that people take what she says seriously, and put her advice to good, practical use. I hope that will be the case with this column as well. Thank You, Dear Abby, for spreading the word! 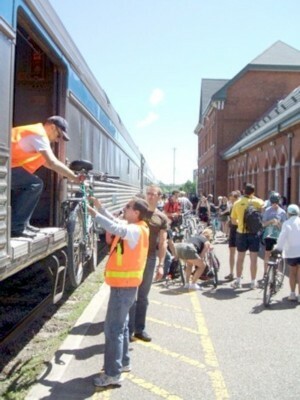 The website Bicycle Frenzy offers up an excellent article full of tips on Bicycling Activism for those with the knowledge, time, and sometimes even resources to pull it off. While money, and even knowledge, isn't everything, time is of utmost importance where Advocacy is concerned. Sometimes I wish I had more time, and knowledge, to be more of a BikeBlogger, and active advocate for cycling than I've been all these years, but I don't let that discourage me from doing what I can. My Average Page Loads are currently 114 a day, Unique Visitors 91 a day, Firstimers 84 a day. You know how I look at that? Positively: That's 91 people a day discovering what I have to offer, in posts, and resources, that didn't know this material was out there to be discovered and learned from. I can write and read about bicycle advocacy all day long on this site. I could post 25 times per day and even if I had 40,000 readers per day taking in everything I write, it will never do any good if no one acts on it. The best advocacy in the world for any issue, not just bicycling, is totally useless if someone doesn’t take action to do something. He goes on to say that there are many ways to be an activist, many ways to take action, and support cycling. I look at his list and I smile in satisfaction as I realize that, hey, I AM an Activist! My audience is miniscule, but every month I get e-mails from ordinary people, and "important" people, with questions, tips, compliments, and more, and from time to time other Bloggers comment on, and link to something I wrote. This all means that my efforts have not been in vain. The more you ride your bike, the more others will see you riding. This has a ripple effect of passively encouraging others to do the same. It has been said that the average cyclist influences at least 3 others to start cycling. I know that I am directly responsible for at least 5 people getting started. I don't know how many people I've encouraged to ride, but I know I've encouraged lots of people to ride in places, and ways, they have never thought to do so. Join a Local Bicycle Club. There are local bicycle clubs all over the place. There are multiple clubs in every major city in the U.S. and clubs in many smaller towns as well. If there isn’t a club in your town, start one. Nothing is more effective at changing local laws or growing support in a small are than a local group of active cyclists speaking up for what they want. Years ago I was briefly a member of the LA Wheelmen, and last year I join the OC Wheelmen. Look in my sidebar, and you will see a list of Clubs from Ca. and every other state in the United States. If one is close to you, then check out their website, and go on a ride, to learn more. Contact your local City Council. Usually the City Council is who you should contact to get road and signal safety issues addressed within the city limits. They also influence and under some circumstances can change local laws as well. Write letters to the editor in your local newspaper. Writing a letter to the editor of your local news paper is a great way to get your opinion heard. If there is an issue that you feel isn’t getting enough attention write to the paper about it. They may publish your letter and/or do a follow up story about it. This can grow a lot of public intrust about an issue. I was also profiled in a Local Weekly a few years back. I've corresponded with the Outdoors Columnist of the OC Register a few times as well, though nothing has come of that correspondence as far as a write-up in the paper. Join your state bicycle association. Almost every state in the U.S. has a bicycle association of some form. Here in Missouri there are several different associations that represent road racing, off road racing, and cycling as a whole. Your state probably has similar groups. These groups can effectively represent cyclists on a state level to state governments to encourage and improve cycling state wide. Years ago I was briefly a member of the California Bicycle Coalition, and rejoined them last year. Once, a few years back, they kindly paid me a great honor, thus encouraging this fledgeling BikeBlogger in his efforts. Look in my sidebar, and you will see a list of Advocacy Groups in CA., and from every other state in the United States. If one is close to you, then check out their website to learn more. Join a National Bicycle Association. You can also join a association like USA Cycling which represents bicycle racing in the U.S. An association like USA Cycling has the resources and contacts to get issues heard by the federal government. Or do like I have done and join Rails for Trails, Adventure Cycling, and the League of American Bicyclists. Look in my sidebar, and you will see lists of national and internationl organizations. Check out their websites to learn more. Contact your State and Federal Representatives. Every citizen has the right and the ability to contact your government representatives. You can call, e-mail, snail mail, and even visit your state and federal representatives. Each of these representatives have staff members that read these letters and messages. The most compelling and unique messages get the most attention. So hand write a letter or get everyone in your bike club to send an e-mail with the same subject or get them all to call their representative on the same day. In the 2 years I spent writing about Critical Mass I had debates with the founders, activists, and supportive politicians. Agree, or disagree, you must admit it was all quite informative, and absolutely fascinating. So, as Bradley writes, get out there, when you can, and however you can, and start making a difference! One way I've found to spread the word about The Cycling Dude is to pass out Business Cards, and distribute Flyers. Looking for news tips, story ideas, and the rare contributor appearance. While the tips and story ideas keep coming in, the contributors have been few. Like Bradley I hope that if you have any other ways to spread the word please leave a comment, here, or at his place, or write a post on your blog, and link and trackback to this post, or send me an e-mail with the link. This is so cool, and very kind. As I wrote, above, I've passed out Business Cards, and Flyers. A Flyer is on the Bulletin Board near the Bike Shop at the REI in Santa Ana, Ca., and I gave my card to the guy at the Huntington Beach location who helped me fix a flat a few months back. You can read more in a report by The Corporate Social Responsibility Newswire. Me Not Missing, Just Busy! I got an email from a fellow BikeBlogger, today, that sent me searching for myself. I can't find your blog online any more. Is everything ok? As you can imagine this concerned me greatly. After checking to see that I was still here, both physically, mentally, and blogally, I quickly wrote to assure my friend that I was still alive and kicking, and to inquire as to how he came to the conclusion that I might not be. People will no doubt notice the infrequent posting recently, I'm sure. I've had a few things going on, from some writing related to my other blog, the fact that I had no time to do any bike riding, and the fact that now I have to spend my days, for the moment, at the beck and call of the government, for possible Jury Duty (So far just daily check in calls to find out if they want me to come in and sit in the waiting room.). 1. "Bike commuters don't usually mind a little bit of adversity. Things like rain, cold, wind, traffic and all those other maladys can be fun when they happen occasionally. None of us want to put ourselves at risk of getting clobbered, but occasionally we do happen into a predicament." 2. "After finally realizing, (it took four years), that I could easily continue commuting by shortening my route, I managed to get two days of commuting before getting sick." Read the follow-up to #1: Two and Out, which has some nice pictures. It seemed like everyone was feeling mellow. The walkers were walking slow, the bicyclist were riding easy, the dog walkers were moping along. It was one of those afternoons when everyone was feelin' alright." Tag along on a ride from which he shares some wonderful photos. They are saying that LA County, and the OC, will get anywhere from 2 to 5 inches of rain from a Pacific storm that is apparently hitting LA later today, and will hang out in the OC from Saturday afternoon to Sunday morning. Welcome to the 11th edition of The Tour de Bicycling Blogs! This ongoing series is about bicycling, and bicyclists...Recreational Bicyclists, Bike Commuters, and Activists. It is about those of us whose blogs are devoted to writing about our bicycling escapades and about anything else cycling related that catches our attention. 1. Adventures of the Crazy Biker Chick seems to have stalled for the time being in November. If you want to know why Tanya has been one of the best Canadian BikeBloggers, since 2004, then check out this wonderful October post: Urban Jungle vs. Quiet Countryside. Here's hoping she some day returns. Design of the Arantix Mountain Bike. 109 years ago, this past weekend, a composer died while riding his bicycle. Ever get bored just biking in the big city? Why not launch a few balloons then follow them through the streets? Better yet, why not attach a compact digital camcorder to the balloons and record their journey? Well a group of cyclists did just that, and he shares the 11 min. Video, and a song the escapade brought to mind. His 2 year old Granddaughter now has a Glider Rider! A couple of months ago the Wichita, Kansas chapter of the MS Society invited me to ride in their event and speak at their dinner. As those of you who have participated in charitable rides like this already know, the atmosphere is almost always electric and addictive. This particular ride was even better than usual, especially because of the presence of a few special people. I told Matt how sorry I was to hear about his son’s situation. Just then a tentative young man stepped out from behind him. “This is my son, Jacob. He’s thirteen. Today he rode forty-one miles with me,” Matt said. Want to be absolutely blown away? After you do so, please watch a video of Lose the Training Wheels students in action. You can visit the organization’s web site by clicking here, or email them at matt.hampton - at -losethetrainingwheels.org, to learn more. In Virginia cyclists apparently have to REALLY mind their P's and Q's. The intent of the law was that real abusers -- those with a chronic record of dangerous driving that endangers other road users -- would be made to pay for their reckless driving. Apparently a judge saw things the Officers way so Cornish must either pay the fee or fight his case in court. Cornish says his reckless driving ticket might one day be funny, if it weren't so confusing. "I get some people who laugh," he says, "and I get some people, like me, that are lost." He reads his ticket out loud. "Year? None. Make? None. Type? Bike. License? None. State? None." Cornish has to pay an abusive driver fee - he says $350 each year for the next four years - for a ticket he got on his lunch break. "So I turn and I go into the parking lot," he remembers, "and I get pulled over for recklessly driving on a bicycle." State Delegate Dave Albo (R-Springfield), the mastermind of the fees -- and a traffic attorney (figures!) -- is more than a bit surprised that a judge would apply them to a bicyclist. Considering the ignorance and prejudice many display toward cyling and cyclists I'm not surprised at all. Mr. Albo apparently didn't think his idea thru far enough before fighting to get it enacted into law. The Governor is looking into overturning the law. Bicyclist hit with $1050 Abusive Driver Fee by Alex Roy of Team Polizei 144. Bicyclist gets ticket for reckless driving- WAVY-TV. A Newport News, Virginia court applies the abusive driver fees to a man riding a bicycle - thenewspaper.com. This is a cool story about a worthy cause. Friedreich’s ataxia is a life-shortening, debilitating and rare genetic neurodegenerative disorder. Onset of symptoms usually occurs between the ages of 5 and 15. Symptoms include muscle weakness and loss of coordination in the arms and legs; impairment of vision, hearing and speech; aggressive scoliosis (curvature of the spine); diabetes, and a serious heart condition. Most patients need a wheelchair full-time by their late teens and die as young adults. There is currently no treatment or cure. January 3, 2008 — Kyle Bryant and Team Ride Ataxia are preparing to begin their second cross-country journey to draw attention and raise research funds to find a cure for the rare neuromuscular disorder Friedreich’s ataxia with which Bryant and other teammates are affected. The team will begin the ride on March 15, 2008 at the state capitol building in Sacramento, CA and conclude in Las Vegas, NV on March 27, 2008 at the National Ataxia Foundation’s 51st Annual Meeting. It will be a 13-day trip covering 600+ miles. Check out the Blog linked above, and a short video by Kyle. The rest of the Press Release can be read at the Blog of Kyle's friend, Bali What?